Before sunshine laws went into effect throughout the country, community engagement in the public meeting process often was scant. Decision makers could quietly decide what they thought was best for the community they served and just make it happen. Those days don’t exist anymore, thankfully. But far too many governments are mailing it in. It doesn’t have to be this way. And it shouldn’t. Improved digital engagement tools, powerful government website design, and target social media tools mean there’s no excuse for government to not be transparent and open. Are you worried that your agency’s community engagement process is lacking? Granicus partnered up with Nextdoor, a social media network focused on neighbors and neighborhoods, for a webinar that offered helpful tips and information to get started. 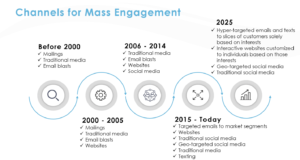 It’s important to recognize how the typical engagement process works right now. We’ll start with an example: A city is considering redoing a street that runs through several neighborhoods. Far too often, legislation would be introduced at a meeting and citizens who showed up (rarely representative of the population at large) could say their piece. Meeting minutes and a video of the meeting are released sometime after that. And if the public is lucky, a press release is issued. In the case of the road project, significant work should be done up front to find out how this project lines up with strategic goals for the city and then seeking the input of those affected. For instance, perhaps the city intends to install bike lanes, but there are a number of ways to reconstruct the street to meet this goal. Using tools like Nextdoor, city government can target a poll to those registered in the affected neighborhoods to get their opinion. Before the meeting is a time to create action items around the project and to continue to elicit feedback from the public. A lot of folks can’t attend a meeting at 7 p.m. on a Tuesday: They’re working the evening shift or have kids to shuttle around or public transit makes it hard for them to get to the meeting. Ensure you’re providing multiple avenues to chime in. One way to do this? Use the right legislative management software. 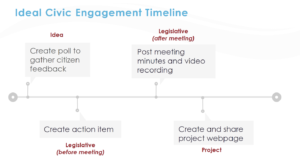 Several tools in our govMeetings solution provide ways for those not attending a public meeting to make sure they’re heard. Meetings have wrapped up, but even if legislation is passed, engagement is over. Meeting minutes need to be published, and recorded video should be posted. People who didn’t attend—or who just need a refresher on what happened—should have a variety of ways to find out what happened. This also means accounting for those with disabilities. Don’t forget the closed captioning on your video! About 8 percent of Americans need it—more than the percentage of people using Internet Explorer—so not doing this significantly cuts into available viewership. Unless legislation is a one-off thing that can be completed quickly once passed, it’s likely part of a larger project (whether that’s the city budget, road reconstruction, etc). The road reconstruction mentioned earlier is a good example of this – there’s pre-construction polling that you’ve conducted and input from citizens from meetings, the road layout once that has been decided, detour information, and photos and updates along the way. With all this information, it’s best to provide a single source of truth that citizens can easily find. The best way to do this is to have a project page with all relevant information. It’s important to have good government website design, update the page regularly, and to promote it through a number of channels. Granicus’ govDelivery solution lets you target users that have opted in for topic-specific information. Social media tools like Nextdoor allow government to target by neighborhood. Perhaps the road project runs through neighborhoods A, B, and C, and the city is starting to tear up a section in neighborhood C that will require cutting water there. This would be important information for people living in neighborhood C to know, but those in A and B might be less interested. When the project is done, it can be archived on your website. But don’t turn your government website into a filing cabinet. Be sure you have policies in place to determine when it’s appropriate to remove the page. Collaborative, not top-down: Government needs to recognize that citizen-customers have expertise and knowledge that it doesn’t necessarily have. Staying humble and working with those it serves is key. What does this shift mean? 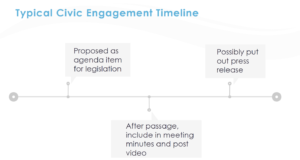 New models of community engagement can seem scary to government at first. Often the only people who show up to meetings are the most passionate of the bunch, and legislators don’t necessarily want to deal with even more of them. It’s important to remember that expanding the people you listen won’t result in chaos – it will bring about better, more democratic legislation. Listening to more voices doesn’t mean that every topic requires weighing them equally. After all, if you’re discussing expanding the women’s bathroom, you very well might get a lot of comments or feedback from men, but it’s not very important. All of this change requires more than just a shift in tools (better government website design, digital communications, and legislative management) and processes; it requires a shift in culture that puts citizen-customers first. Interested in hearing more on this topic? Check out our webinar on the power of using Granicus and Nextdoor together.